Professor-at-Large nominations are reviewed by a selection committee consisting of the Dean of the Faculty, the Dean of the Graduate School or other representative of the President, the Chairman of the Program, the Dean of Students (ex officio member), and nine other faculty members appointed by the President for staggered three-year terms upon the recommendation of the Nominations and Elections Committee with the concurrence of the Faculty Senate after consultation with the past selection committee. The recommendations of the selection committee should be referred to the President for approval and for action by the Board of Trustees. That a new category of non-resident Faculty membership be established at Cornell University with the title Professor-at-Large. That, subject to availability of funds, the Professors-at-Large will be welcome on the Campus at any time, and would then have all customary Faculty privileges. That the Professors-at-Large be appointed for a term of six years, with the possibility of renewal. 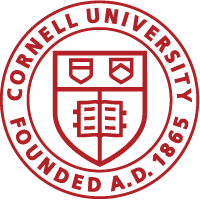 That conditions of appointment be that the nominees (a) agree to accept the formal title of “Cornell University Professor-at-Large,” and (b) agree to spend a minimum of two consecutive weeks every three years on the Cornell Campus. That Professors-at-Large receive an appropriate stipend, and travel expenses for each visit to the Campus. That the total number of Professors-at-Large should not normally exceed It is suggested that a substantial number of these Professors-at-Large be from foreign countries. Vacancies in the Program should be publicly announced, and nominations solicited from departments, groups of departments and individual faculty members. All nominations should be supported by careful documentation, including a vita with a summary of the nominee’s outstanding accomplishments, positions held, honors received, together with a selected bibliography and letters attesting to the merit of the nomination from internationally recognized experts inside and outside Cornell. Adopted by the University Faculty, January 13, 1965, Records, pp. 3127-30; February 10, 1965, Records, p. 3131; FCR, February 14, 1979, Records, pp. 4835-36C, Appendix A; FCR, February 9, 1994, Records, pp. 7257-58C, Appendix B. Changes to reflect amendments to Organization and Procedures of the University Faculty, October 1995. Amended by the Faculty Senate, February 9, 2000, Records, pp.